This is the busiest time of year for wildlife companies because the mating season is just beginning, which means we have already started seeing baby raccoons and squirrels across Ontario, Quebec and Nova Scotia. At Skedaddle Humane Wildlife Control one of our top priorities is keeping animal families together after their removal. Removing wildlife from homes this time of year is especially complicated when babies are involved and takes a lot of expertise. We do so many removals in a season, we thought we would take a breather and explain some of the most common questions we receive from customers during spring and summer. 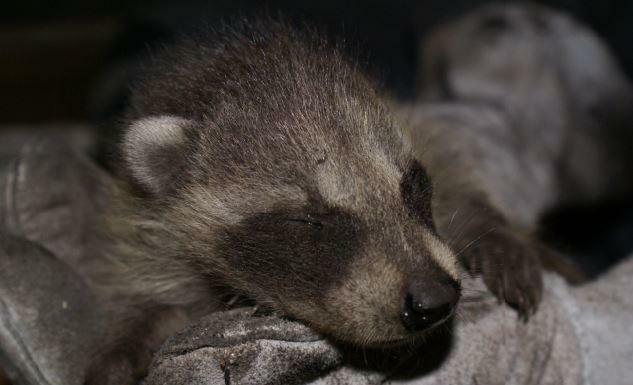 Most baby animals found inside attics, under porches or down chimneys are not mobile for several weeks to months after birth. That means the only way to remove them humanely is by hand. This method is both effective and significantly reduces any chance of injuring them. Once the babies have been retrieved, they are placed inside a specially designed and heated reunion box with the insulation they’ve been living in. This baby reunion box is designed so that it can be placed near the entry point so their mom come back and get them. Why do you need the insulation? It sounds gross to you and me, but these babies have been burrowing and defecating on this insulation — this is their home! Using existing nesting material to line the box helps keep the babies warm and allows for the mother to pick up their familiar scent now that we’ve taken them outside their den site. There’s no substitute for comfort! Wait. You guys don’t relocate the babies? Raccoons, like many other species of wildlife, typically have numerous den sites throughout the neighbourhood. When we’ve removed the babies and placed them in the baby box, mom must exit the den site in order to reunite herself with them. Our technicians will have prevented her from getting back inside so the mom is forced to relocate her babies one-by-one to one of her other den sites near by. Relocating and separating a mom from her babies is not only unnecessary, it’s also ineffective and inhumane. I saw the mom leave one night and just sealed the hole. I should be ok now, right? Wrong. This is the worst thing a homeowner can do during this time of year. For one, the mother raccoon or squirrel is coming and going, getting food and materials to make the nest inside your home more comfortable. As annoying as that sounds, it’s also crucial that you allow them the freedom to come and go because it makes it easier to solve the issue. If a mother gets locked out from her babies, she will do whatever it takes to try and get back in, including ripping and chewing apart shingles, siding, and other materials that would have remained intact otherwise. Ok, that makes sense. 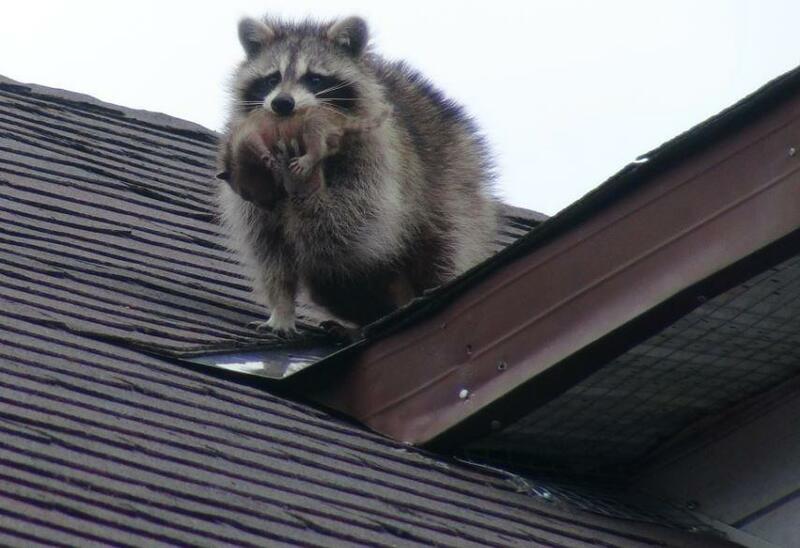 But what do you do with the mother raccoon? Mom is an old pro. She knows the neighbourhood inside and out has many hiding places where she can take her babies and raise them safely. 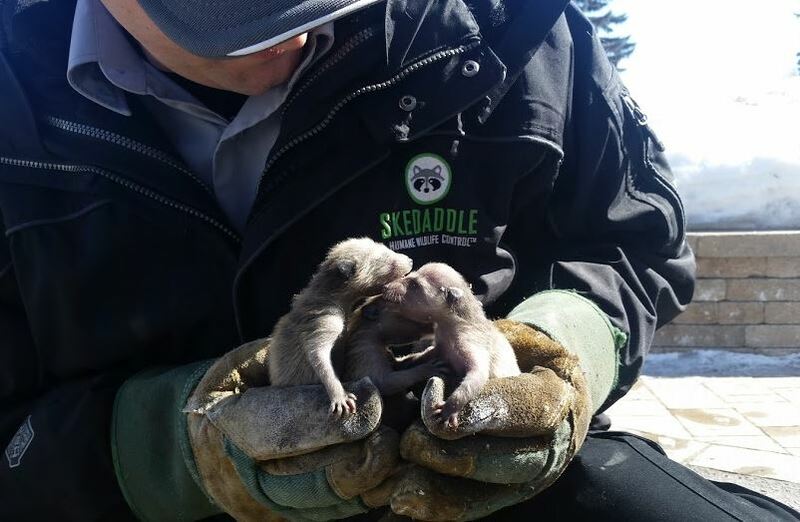 Now that Skedaddle Humane Wildlife Control has taken her from one of her den sites and sealed and protected it against her re-entry, she will have no choice but to just move on to another site — with babies in tow. Customers hire us because they care about wildlife, but they also want to protect their assets. Luckily we can take care of both. It’s important to hire a professional company with many years of experience removing animal families. If done incorrectly it could cause needless harm to animals and additional property damage. Why do squirrels live in attics?